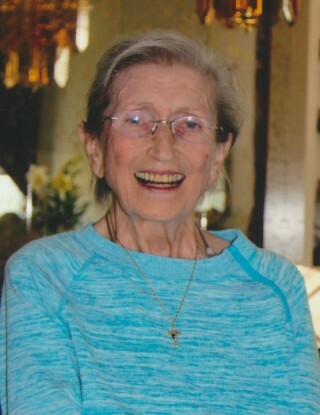 Obituary for Mary Teresa Nai | Price Funeral Chapel, Inc. Went home to be with the Lord due to complications from pneumonia. Mary was born in Joliet, Illinois, the only daughter to Josephine and Floyd Shepard. Mary had an enormous unconditional love for her animals and her husband Augustus (Gus). Mary leaves behind her husband of 47 years, Augustus, Her son Gary (Pat) Goodwin, daughter Katherine (Stephen) Marks, her son the late Timothy Goodwin and her daughter Robyn Morris. Also, nine grandchildren, Paige, Gary Jr., Michael, Joseph, Christina, Timothy Jr., Christian, Jacob and Zackary; seven great-grandchildren, Hailie, Helaina, Hunter, Hudson, Harry, Taylor and Savannah. Funeral services are held January 31, 2019 at PRICE FUNERAL CHAPEL, 6335 Sunrise Blvd., Citrus Heights, CA 95610 at 10:00AM. Cemetery burial immediately following at Calvary Catholic Cemetery 7101 Verner Ave., Citrus Heights, CA 95621.